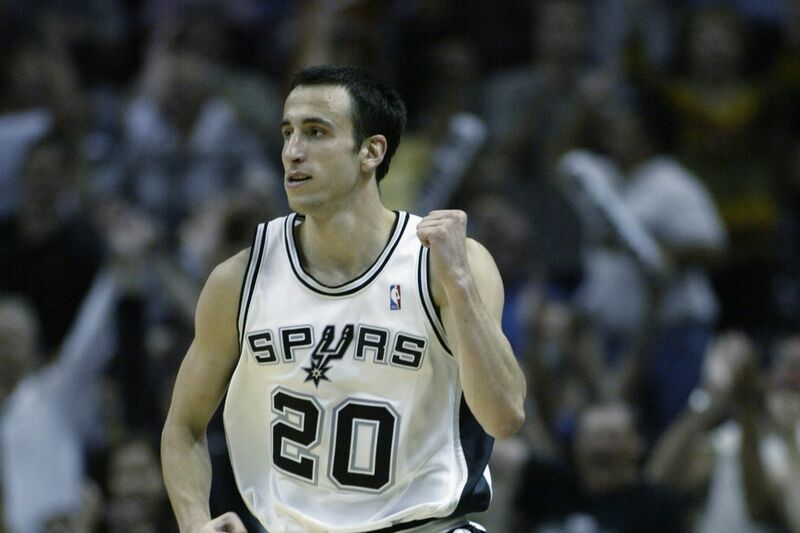 The Spurs’ 2nd round selection of Manu in 1999 was as innovative as the Argentine’s Euro-step. There’s no contest: The Spurs’ selection of Manu Ginóbili, with the second-to-last-pick of the 1999 NBA Draft, is the most efficient and pound-for-pound valuable draft pick ever. There’s a thousand ways to measure this. There’s also a thousand ways you can’t measure this, given Ginobili’s significant contributions to San Antonio’s self-perpetuating team culture. But here’s one measureable: of all players who have played at least 300 games (about four seasons) since Box Plus-Minus was first tracked in 1973-74, Ginobili ranks 17th overall. Of the 16 players above Ginóbili, the lowest draft pick in that group is, of all people, Kawhi Leonard, at 15th overall. Ginobili was taken with pick #57. As you continue down the list, you don’t bump into another second-round draft pick until Draymond Green, who ranks 35th. The next true contender to challenge Ginobili’s pick, in terms of exceeding expected value, is Ben Wallace, who ranks 40th. Wallace is the highest-ranking undrafted player on the list, picked up by the Washington Bullets in 1996. Still, Washington fumbled their brilliant move away in 1999 by trading away Wallace’s prime years. San Antonio had gained a talent advantage by drafting Ginobili, but they only converted that talent to wins after exercising extreme patience, i.e., waiting three seasons just to bring him over from the Italian league. The Ginobili pick was so good that it changed the way the entire league drafted. It certainly changed the way the Spurs drafted: San Antonio has been the United Nations of basketball teams for a long time now, but Manu was the first non-NCAA player draft pick in franchise history. 35th / Mavericks / Bruno Sundov, at 18 years old, had led Croatia to victory in the (now-defunct) International Junior Tournament. 27th / SuperSonics / Vladimir Stepania won three straight Slovenian championships with KK Olimpija, plus advanced in the Euroleague each year. 18th / Rockets / Mirsad Türkcan also won three straight domestic championships, but in Turkey, with Anadolu Efes. 17th / Timberwolves / Rasho Nesterovic was in the starting lineup for Kinder Bologna when they won the 1998 Euroleague just a few months earlier. 9th / Bucks (traded to Mavericks) / Dirk Nowitzki — who was himself one of the most visionary nineties draft picks — had dropped 33 and 14 on America at one of the first Nike Hoop Summits that spring. Compare this to Ginobili’s C.V. at the time he was drafted: 1998-99 was his first season outside of his native Argentina, a country that had not traditionally been a hotbed for basketball talent. Ginobili spent that season in Italy, where he helped his club Viola Reggio tie for second place — in Italy’s second-tier league. When San Antonio drafted Ginobili, he was still a minor leaguer. The Spurs were among the first to realize that an international prospect shouldn’t be awarded because of what their teammates had done around them. They should be evaluated for how their skills project to the future. As Mark Olsen noted in a post last month, this philosophy of projection helped unlock one of the greatest draft picks of the last ten years: Giannis Antetokounmpo, taken 15th overall by the Milwaukee Bucks after he had played in Greece’s minor leagues. It’s incredible that the Bucks even found Antetokounmpo: in Greece, he was playing in gyms that are significantly smaller than anything an average American high school plays in. There is only one second round pick in recent years that has a chance of challenging Ginobili’s pound-for-pound value: at 41st overall in 2014, the Denver Nuggets selected Nikola Jokic: a monster superstar hiding in plain sight. Many statistical models ranked him as a top 10 player last year, just his second in the NBA. At the time he was drafted, Jokic had played just 43 career games for KK Mega Leks, which is among the better professional teams in Serbia, a country with a population about the size of Virginia’s. While that’s nowhere near as obscure as Antetokounmpo’s barren gyms, Jokic was still a basketball solar system away from the Euroleague and the most prestigious international competition. The Nuggets could only ever consider Jokic by valuing his projection, and not his accomplishments to date. If anything, the 2014-2016 drafts have seen teams trust too much in projection, and not enough in past production. Teams around the league are running experiments, if you will, in developing prospects like Dante Exum (drafted out of Australian high school), Bruno Caboclo (Brazilian league), Juan Pablo Vaulet (Argentinian league), Satnam Singh (India, Florida’s IMG Academy), and Thon Maker (Canadian high school). While Exum’s development track has been knocked off-kilter by an ACL injury that cost him the 2015-16 season, the most successful player out of this group so far has been the rookie Maker — who is with the same franchise that helped develop Antetokounmpo. Perhaps it was a coincidence, or perhaps it was a course correction: none of the nine non-NCAA players taken in the 2017 Draft came from anything like these completely experimental backgrounds. On the other hand, even more patience may be required with these kinds of prospects: it’s been three years since the 2014 Draft, which is the exact length of time that Ginobili was stashed away in Italy. There are few things more familiar in the NBA now than Ginobili’s exquisitely spastic off-kilter buckets, a continuously effective repertoire that has been in use for a geologic length of basketball-time. It’s useful to remember that the way Ginobili entered the league was anything but familiar.